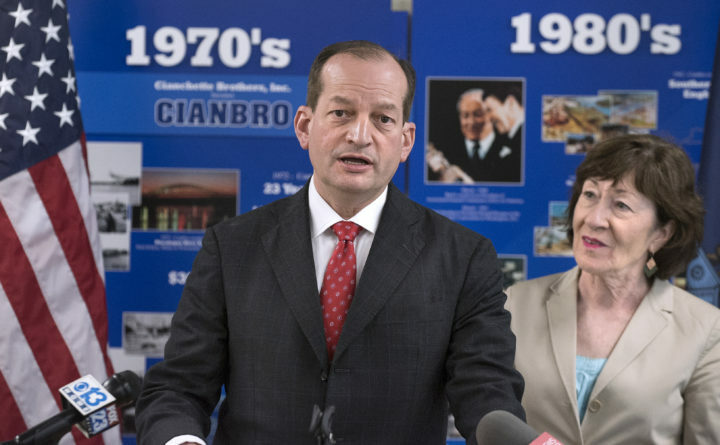 U.S. Secretary of Labor Alexander Acosta (left) and U.S. Senator Susan Collins speak to the media during a visit at the Cianbro Corporation training facility in Pittsfield Tuesday. Since the state’s largest construction and contracting company began offering its own employee workforce training in August, more than 1,000 employees have received 53,000 hours of training — a feat that was praised by U.S. Secretary of Labor Alexander Acosta and Republican Sen. Susan Collins. “These are programs that are making a real difference in making sure Mainers have the skills they need to get good jobs and to stay in Maine,” Collins said, standing next to Acosta at the Cianbro Institute in Pittsfield on Tuesday. Accepting Collins’ invitation, the pair toured the Cianbro Corp. training center and headquarters Tuesday afternoon, which included slipping into classrooms to observe what Cianbro employees were learning. The training center offers Cianbro employees comprehensive job training and apprenticeship opportunities in exchange for pay — a perk that allows Cianbro to ensure its employees’ job and safety training is uniform. The training also functions as an incentive for employees, whose in-house training doesn’t require them to take time off work or dip into their own pockets, Cianbro Chairman and former CEO Peter Vigue said. His son, Peter “Andi” Vigue succeeded him as CEO on Jan. 1. Cianbro employs approximately 4,000 people across the country, more than a third of whom live in Maine. Some of its ongoing projects include the Bangor Savings Bank campus on the banks of the Penobscot River in Bangor, the new WEX campus in Portland, and two federal contracts: one with the U.S. Navy to make improvements at the Portsmouth Naval Shipyard in Kittery, and another with the U.S. General Services Administration to replace a port in Alexandria, New York. Gone are the days of sending equipment operators, welders and millwrights to a third party for training, Vigue said. The success Cianbro has found in its model is something that should be financially supported at the federal level, Acosta and Collins agreed. “Certainly a role for the federal government is to do quite a bit of workforce training,” Acosta said. Both federal officials took less defined stances on how an increase in the state minimum wage would play a direct role in Maine’s overall economic and workforce growth. “I can say that on the federal level, I believe that we’re overdue for an increase in the minimum wage … but I don’t see that coming up this year,” Collins said. “The great thing about learning more skills and getting more education is your wage or salary is going to go up regardless of what the minimum wage is,” she said.